Add a block to your page which lets you add an annotation for your page. This feature is an initial implementation of a feature for the SmartEvidence functionality. You can learn more about SmartEvidence from the presentation “SmartEvidence: Why did it come about, and what is it?”. Annotation: Write your annotation for your portfolio page. It will help to situate the evidence that you put together on the page, establish the context and tie things together. Allow feedback: When you allow feedback on your annotation, others can leave feedback as usual. 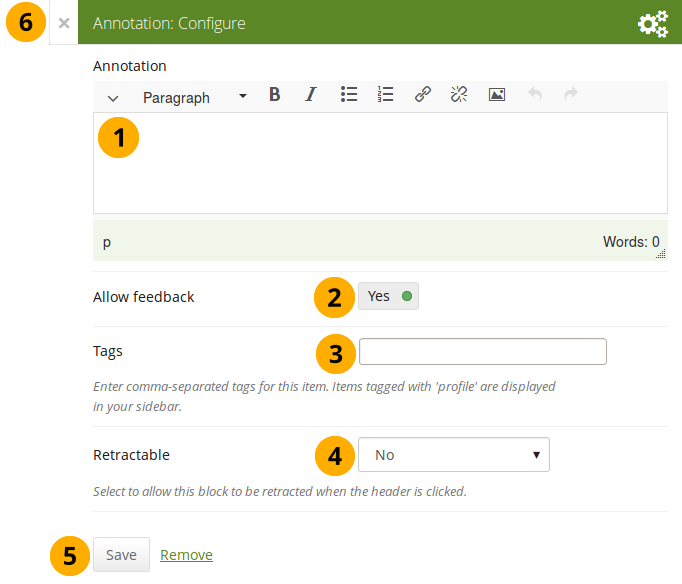 However, as soon as the first feedback has been added, you will not be able to make changes to your annotation text anymore. 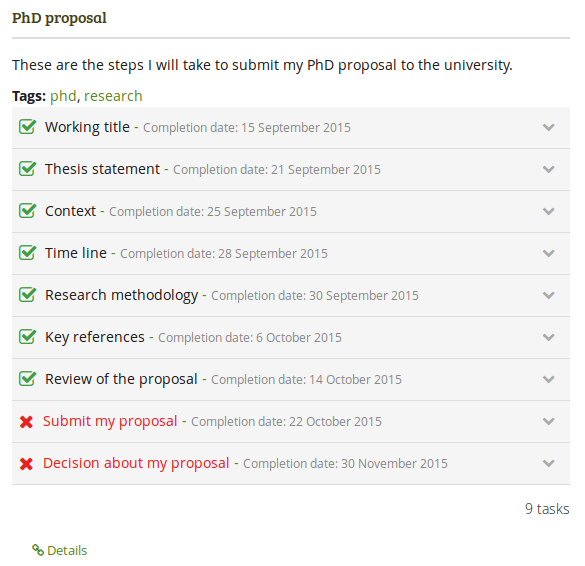 That is to ensure that the feedback still relates back to the annotation. Tags: Enter tags to find your annotation more easily at a later stage. Separate your tags with commas. If you already have tags, you can click on the link Show my tags and select the ones that you think will fit for this collection as well. They will be entered into the text field for you. “Feedback” was renamed to “Comments”. You only see comments when you display a page, but not in edit mode. You can only place 1 comment block onto a page. Comments for individual artefacts is still placed at the bottom of the artefact details pages because you cannot put a block onto these pages. You can move the block like any other block on your page. If you delete the block, the comments are displayed at the bottom of the page again. 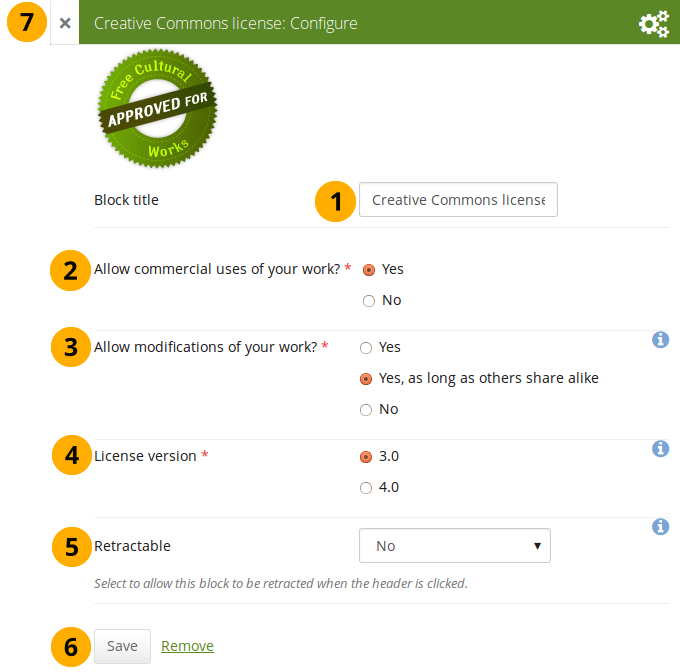 The block has the heading “Comments” unless your Mahara installation uses a different word. 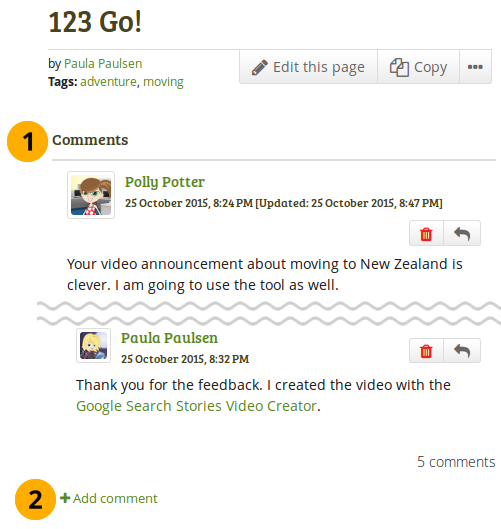 When you click the Add comment link, a modal window is displayed in which you can enter your comments with all the usual functionality. Dates between which regular group members can participate in group activities. This information is only visible if any dates were entered in the group settings. Latest: Display members according to their group joining date in reverse chronological order. Random: Let Mahara decide which members to display. 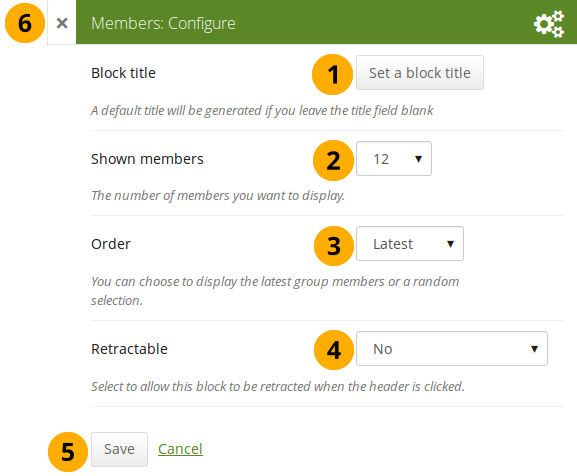 Sort group pages by: Choose in which order to display pages created in the group. “Alphabetical” is the default option, but you can also display them based on when they were last updated. None: No shared pages are displayed. By members of this group: Display only pages that have been shared by members of the group. This option is particularly well-suited for groups that are used for class purposes. That way, students can share their pages or collections with the group for a long time, but the administrator can choose to display only pages of group members but not those that are not members anymore. The pages of non-group members are still accessible via the Shared with me functionality. By anybody: Display all pages that have been shared with the group. None: No shared collections are displayed. By members of this group: Display only collections that have been shared by members of the group. By anybody: Display all collections that have been shared with the group. Submitted pages are not displayed in the section of “Shared pages” and “Shared collections” to avoid confusion whether they have been shared with the group or not. Sort shared pages and collections by: Choose in which order to display pages and collections shared with the group. “Alphabetical” is the default option, but you can also display them based on when they were last updated. 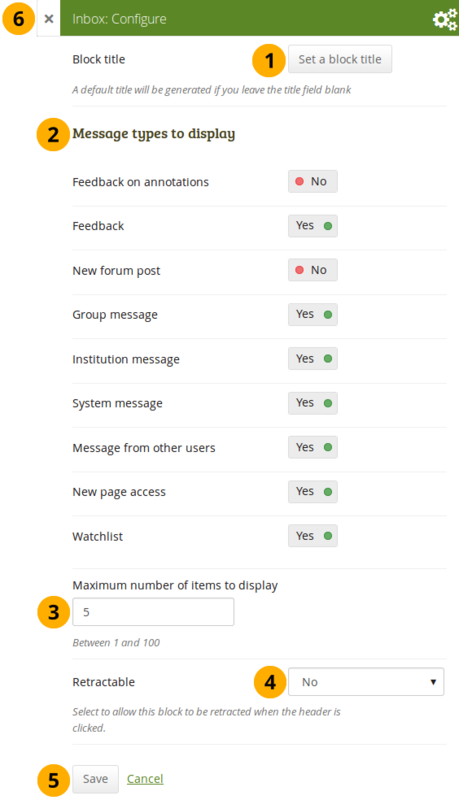 Display submitted pages and collections: Decide whether to display pages and collections that group members submitted to the group. There is no distinction made between pages and collections. “Yes” is the default option. Sort submitted pages and collections by: Choose in which order to display pages and collections submitted to the group. “Alphabetical” is the default option, but you can also display them based on when they were last updated. 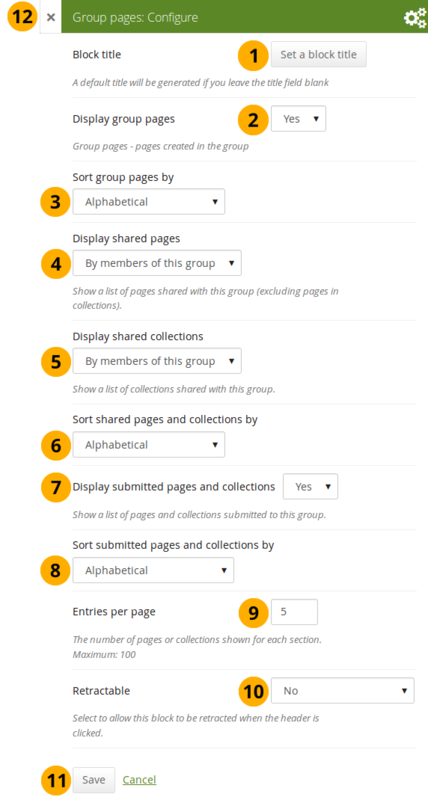 Entries per page: Choose the maximum number of pages or collections you wish to see on the group homepage for the above before a paginator is displayed. You can display a maximum of 100 items per category. 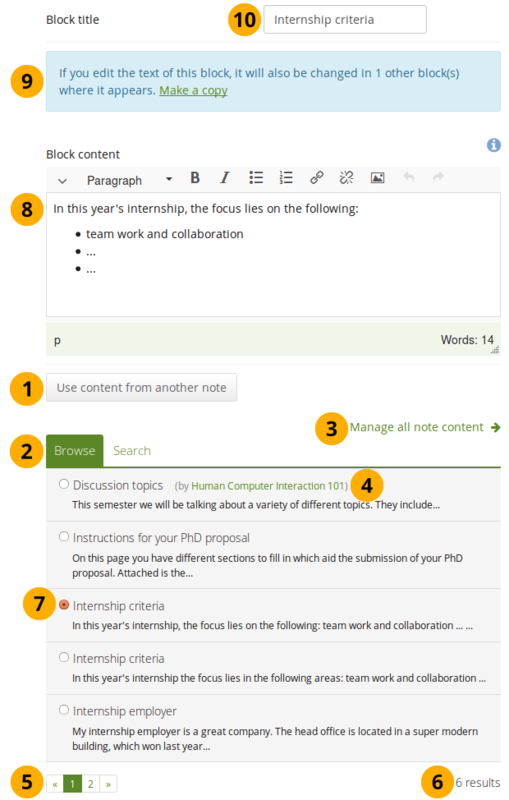 A page is considered as modified when the content of at least one block is updated, including the adding of a new Mahara journal entry into the journal block. Message types to display: Change the switch to “Yes” for each message type that you want to display in this block. 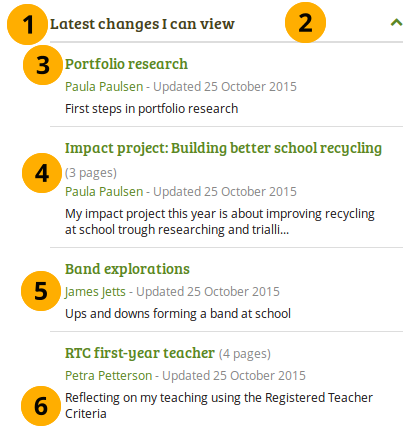 The Latest changes I can view block displays the latest portfolios to which you have access across Mahara. This includes pages and collections. 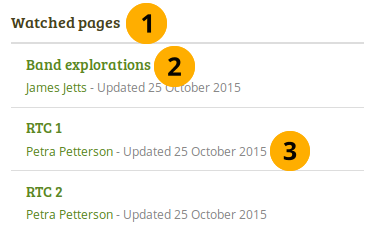 Prior to Mahara 15.10 this block was called Latest pages. 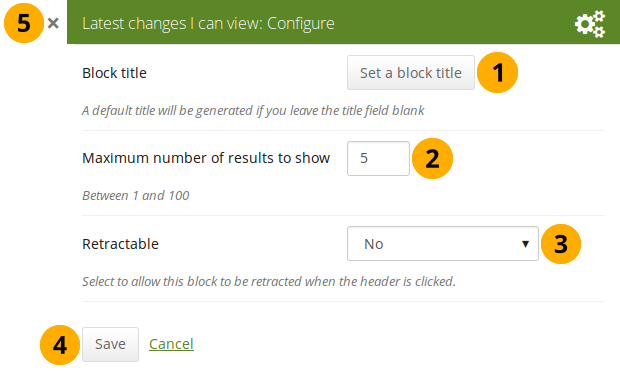 Block title: The automatic title for this block is “Latest changes I can view”. You can set another one if you wish. Maximum number of results to show: Decide how many pages and collections shall be shown on your dashboard. You can choose between 1 and 100. Yes: Allow users to reduce the block to just the heading by clicking on the heading of a block where the Retractable icon is shown. 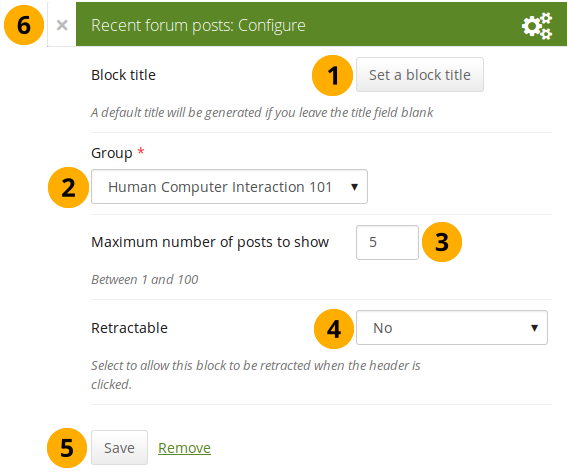 Automatically retract: Only the heading of the block is visible, and the user can click on the heading of a block where the Retracted icon is shown to view its content. 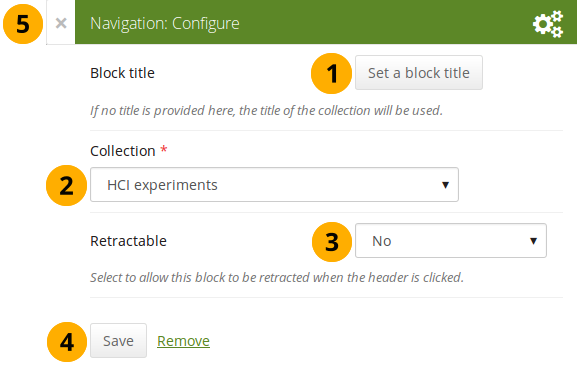 You can also click the Close icon in the top left-hand corner to either remove a newly created block before it is being saved or to cancel any changes and leave the block’s content as it is. The block on your dashboard page looks like the following. 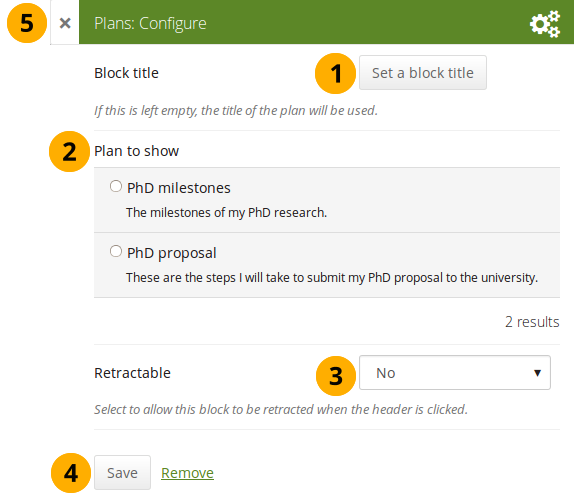 If you chose a retractable option, you can click on the title or anywhere in the title space to change the block’s behaviour. Name of the portfolio author, and when the portfolio was last updated. Add a note to your page. This feature is used when you do not want to keep the text in a journal, but still want to be able to re-use the text on other pages. Block title: Provide a title for your note. Alternatively, you can also use text from another note that you have already written. Click the Use content from another note button to do so. Allow comments: Switch this setting to “No” if you do not want others to comment on your note. This option is set to “Yes” by default. 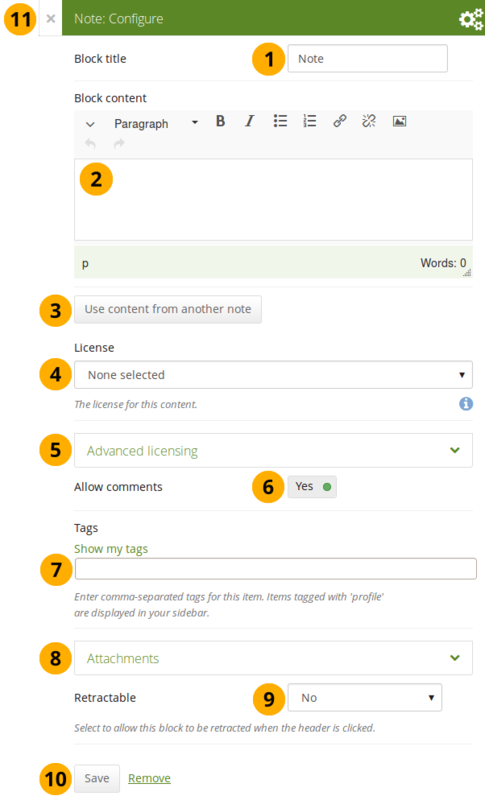 Tags: Enter tags to find your note more easily at a later stage. Separate your tags with commas. If you already have tags, you can click on the link Show my tags and select the ones that you think will fit for this collection as well. They will be entered into the text field for you. Attachments: Attach a file to a note as additional evidence for the text you are writing. Please refer to the section “Insert an image into text” for more information. Click the Attachments panel if you wish to add one or more files to a note. Click the Edit button to change any component of a folder or file, i.e. its name, description and tags. If you have a folder or file included in a page that you submitted for feedback, you will not be able to edit them. Click into the row that contains the file you wish to display in the block to select it. Continue editing your note and save it. You can re-use text from other note from one page in another without having to copy the page first. 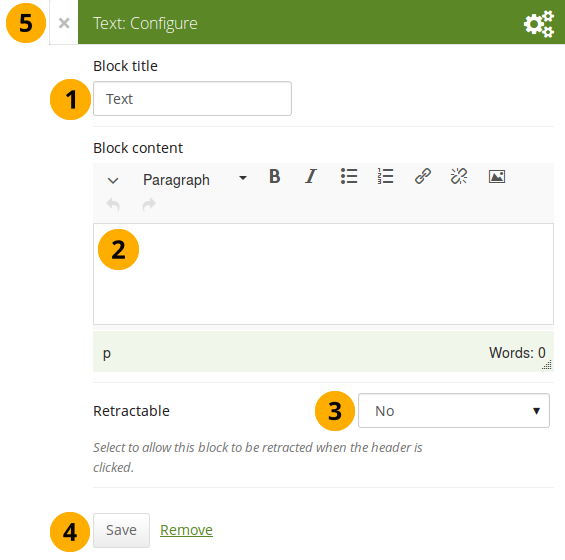 If you do not make a copy of the note content in the block configuration and change it, the text is changed in all other instances where this note is used. Click Browse or Search to find the note that you want to re-use. Click the Manage all note content link to be taken to your personal Notes if you can’t find what you are looking for. All notes are listed with their title and the first line. If a note does not belong to you but for example to a group, you see the author next to the note’s title. Use the paginator to move between your notes if more than 5 are displayed. You see the number of notes that you have access to. Click the radio button in front of a note that you want to use in this page. The content of the note that you have selected is displayed in the Block content box. Now you can make changes. The text will be changed in all other instances where this note appears. If you wish to make changes to the note, but do not want to change it everywhere else, click the Make a copy link above the Block content. The text is then retained, but it is treated like a new note and the original note is not changed. Block title: Review the block title and make changes if necessary. Once you copied a note, the original block title is entered here. You can change the block title no matter whether you change the content of the note or not. All other functionality that you see on the screen is the same as for adding a new note. Add text to your page. This feature is used when you want to put a snippet of text onto a page that does not have to be re-used. In a default Mahara instance, this block is available in the content chooser at the top together with the Image block. It does not appear in the section General as well. Please refer to the section “Insert an image into text” for more information on adding an image to the text block. View your watchlist on your dashboard. Title of the watched page. You can click the link to be taken to her. View the page owner and the date when the page was last updated. This is in particular important information when all your watched pages have the same or a similar title.